I have become very akin to the elder plant (Sambucus nigra) in recent months. I’ve been fond of this plant ever since I learned you can gather the wild flowers to make elderflower champagne and elderflower cordial. But recent solstice and equinox activities have seen the elder plant evolve from a mere foraging opportunity to a symbol of the changing of the seasons, preservation and timelessness. Summer elderflowers have recently given way to autumn elderberries, a bit more challenging than the elderflowers but so too is autumn. The temperature is falling and the days are getting shorter (and wetter). Where the elderflower called for bottled sunshine and refreshing elixirs, the elderberry seems more suitable for winter warmers to help us survive these dark dreary months. I’ve experimented with a few elderberry recipes. My challenge as ever is that I’m not a massive fan of sweet things, so recipes like elderberry syrup are a bit lost on me (thought I’m told it’s quite good). I made an elderberry cordial, spiced with cinnamon and cloves, which recent houseguests loved, particularly when consumed hot as a tea. Mom loved my plum and elderberry “equinox” jam, but I have a hunch she was biased (her former business name was “elderbury”). I didn’t have much luck with Pontack sauce (but then again I don’t eat meat). After a few trials, I was starting to wonder if elderberries were worth the effort. 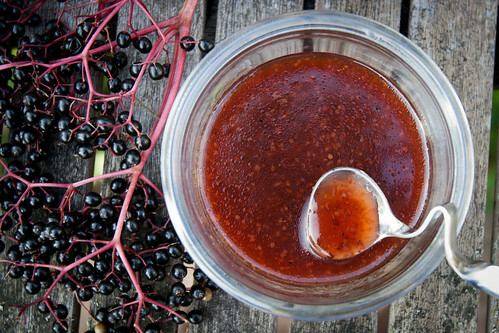 Then I made elderberry “balsamic” vinegar and my whole elderberry world changed! Ok, that’s probably exaggerating, but this stuff is great. The recipe comes courtesy of eatweeds.co.uk and is so simple: soak elderberries in red wine vinegar for five days, then strain the liquid and boil it with some sugar. DONE. And it’s awesome. The first elderberry vinegar revelation was a fresh fig pizza with caramelised onions made (during equinox, of course) with Emily and Robert. We added some of the vinegar to both the onions and the fig before assembling the pizza: caramelised onions, mozzarella cheese, figs, baked then topped with fresh shavings of Old Winchester. This was one of the best pizzas I’ve ever had! 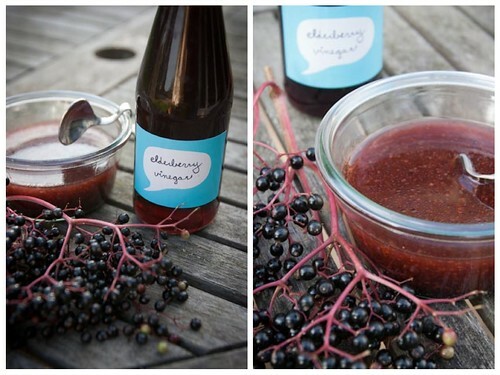 The second revelation is this simple elderberry vinaigrette. 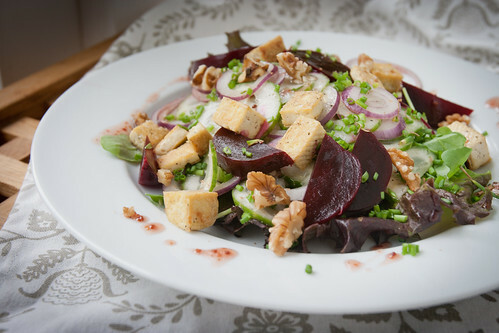 I was seeking something akin to raspberry vinaigrette, a dressing that would go well with salads, walnuts, fruit and maybe feta or gorgonzola if I’m feeling the dairy call. But I didn’t want to lose the elderberry flavour. Hence, this simple vinaigrette was born. It’s a basic combo of oil, elderberry vinegar, dijon mustard, salt and pepper. And it’s delicious! The elderberry vinaigrette is especially good with beetroot and spicy salad leaves like rocket / arugula. I think it will also be a fine match for fruit, too – I’m picturing a chopped salad with apple, celery and walnuts. Or in a true tribute to foraging, a salad of blackberries and chickweed tossed with elderberry vinaigrette and garnished with toasted hazelnuts. There are still elderberries around and I highly suggest you take advantage of them to make something. 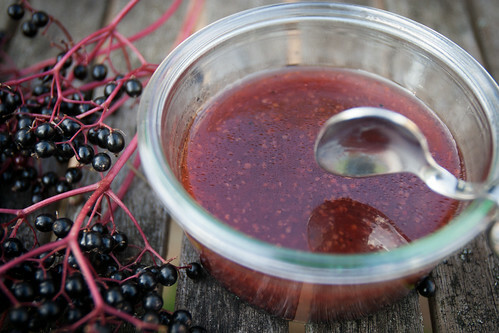 If not elderberry vinegar, then elderberry syrup is a logical place to start because it’s just so versatile (Hunger Angler Gardener Cook has some good ideas for elderberry syrup, including ice cream and pannacotta!). Happy foraging! 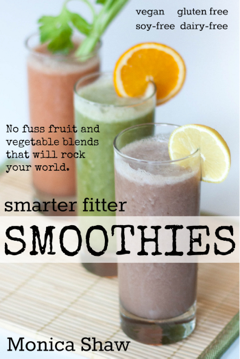 Whisk everything together in a bowl (or use a blender) until fully emulsified and enjoy! I love all your elderberry posts! I’m not sure if elderberries can be found here in my part of the US, but I really should get on finding out as I love all things vinegar.